Here are some lessons from vendors as they try selling to Major League Baseball teams. Seated in the middle of a glitzy conference hall, sporting a ponytail, a purple paisley shirt and the air of a magician, Kyle Donovan pitches his invention, an integrated plastic plate and cup, to a member of the Chicago Cubs. He clicks the top of his cup into the bottom of his plate to show how Cubs fans could hold their beer and plate of food in just one hand. Never again would they worry about how to carry back two beers and two plates of food. “But wait, there’s more,” he adds and, with a touch of drama, produces a fork -- the iFork -- with an extra-curvy top and a little plastic platform at its neck. With this fork, Donovan says, the part that touches your mouth will never lie flush against the table. He got the idea after watching a bird land on a restaurant table in Miami and thinking how gross that was. The same problem, he realized, affects baseball games, where forks touch armrests or tables that have been touched by who knows what. “That’s really neat,” says Cubs procurement manager Kathleen Frost, as if surprised she likes it. “I solve problems,” Donovan explains. Frost says she’ll consider it. Every entrepreneur will eventually face a turning-point moment like this -- pitching an important client who could instantly transform their fortune. What does that moment look like? And what does it take to succeed? This Major League Baseball event offers a perfect window in. It’s December, and the league has invited iFork and 49 other businesses to a convention center in National Harbor, Md., to pitch their wares to individual teams. 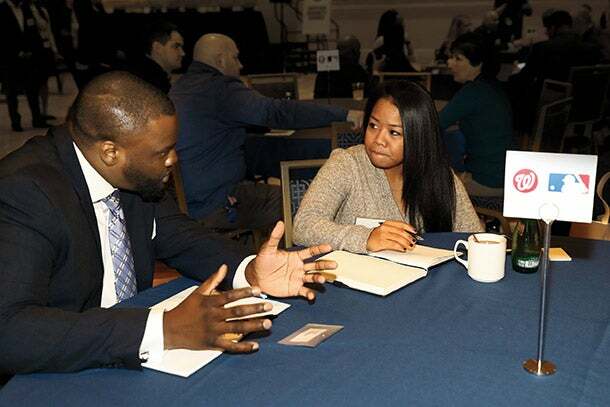 It’s part of the MLB’s Diverse Business Partners program, which was created to increase business with minority- and women-owned companies, and to get more business with a broader range of suppliers, small and large. The MLB has hosted these summits since 2012, and the past four have generated $18 million in business for suppliers who attended. Chris Morrow, of SodexoMagic food services company, chats up Rebecca Valdellon, purchasing manager for the Washington Nationals. Two representatives from Promotional Adventures, a tiny promotional products company based in North Hills, Calif., shift in their seats as Smith speaks. Until now, they’d serviced mostly minor-league sports teams. They’d made koozies, pillows, tumblers and pens. But Jessica Berry, one of the reps, had a plan. She hoped to pitch the Cubs on a giveaway W-flag pillow for their fans, conjuring the flags the team and its fans have flown after every win for nearly 80 years. The only problem: Everyone wants to talk to the world champs this year. So when the quick-pitch sessions start, she heads to the Minnesota Twins’ table instead. Bud Hanley, the Twins procurement manager, nods. He’s been doing this for almost a decade, and is not easily impressed. They are. But in order to get business with major-league clients like these, you need more than just a new idea. In session after session, procurement managers ask and tell potential suppliers the same things: Can you handle large-scale production? How fast is your turnaround? Are you reliable? We hate surprises. We love passion. Oh, and is your price competitive? Dan Goldberg, a brand manager of a big promotional products company, The Ad Solution, which has accounts with brewer AB-InBev and Microsoft, takes a seat across from the Cubs’ Frost to demonstrate a misting fan. “What’s the price point?” Frost asks immediately. Goldberg has been down this road before. He knows teams will push hard on price. “Really depends on quantity,” he says. “I’ll get back to you.” He puts down the fan and snaps a pair of The Ad Solution’s branded shade wrappers around his face, as if it’s a sunny day at the game. Frost laughs and takes his pamphlet. Persistence also pays off for entrepreneurs who are selling services, not products -- a seemingly harder sale, given that there’s nothing fun to plunk down on a table. An event company that manages trade shows found that if its reps kept attending the summits and talking up their business, eventually more clubs would get onboard. A screen-printing company with two clubs as clients now has six full-time printing machines and can offer a single-day turnaround on its products. And a background-check company that has spent more than 15 years with the NFL has come to tell the MLB it needs to be more careful about whom it hires. Of course, for some entrepreneurs, persistence would have to pay off later. Only 20 of the 50 businesses that attended the summit would be invited to participate in the upcoming season’s bidding process, according to MLB. But three months later, some of them would score nearly $300,000 in orders. Among them is Berry from Promotional Adventures, who did not sell the Cubs on the W pillow or the Twins on the fanny pack, but got business with the Washington Nationals. The club asked for a trial run of 1,750 custom wooden Easter eggs printed with the team’s W logo for an April Easter-egg hunt with their fans. If Promotional Adventures passes this test -- delivering the product on time, and for the agreed-upon price -- the club might step up to a bigger, 50,000-piece order. As for the iFork’s Kyle Donovan, by March he and a few MLB teams were in talks, and he was waiting for more samples to come in from overseas. But baseball is only one avenue: Last summer he got his first-ever order from Walmart, for 500 stores. Costco also requested an order for last Christmas, but he couldn’t pull it off in time. He’s confident the broader sports market will open to him soon.